It has been a one and a half years or so that Colour Haze have been saying a live album would be released. They had several multitrack recordings from Roadburn, Duna jam and a few other shows to choose from but I guess this was a very satisfying show and they decided to mix this one in Hannover where they have recorded their last several albums. 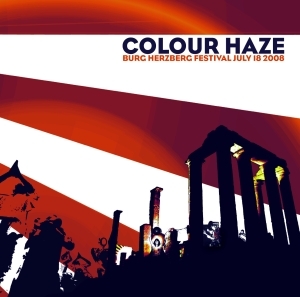 Colour Haze are one of the best German bands around with their own sound. This is solid performance and features the set the band has more or less stuck to the last few years. A few tracks from the early catalog are played like Get it On, Outside, Inside with American Woman and ending the show with Out of the Sun by Grand Funk! The majority of the material is from the last two great records. Excellent sound and mix and playing but the versions are almost the exact same as the studio versions, so I won’t listen to this much. If you are a fan, you will be satisfied with this. Finally, I really hope that this will mark the end to this set of songs as the band has an amazing catalog and no longer represents an exciting band for me to see live, as I have seen them so many times and until they decide to improvise more or play different songs, I won't get excited about them, until the new studio album comes out!